On January 11, 2019, State Councilor and Foreign Minister Wang Yi held talks in Beijing with visiting Minister of Foreign Affairs and International Cooperation Alie Kabba of Sierra Leone. Wang Yi said that over the past half a century since the establishment of diplomatic relations between China and Sierra Leone, no matter how the international situation has changed, the two countries have always enjoyed sincerity and friendship, treated each other equally and supported each other. In 2015, Ebola broke out in Sierra Leone. The Chinese side was among the first to offer a helping hand. The two countries won the fight against the epidemics together, which fully demonstrated the brotherhood of sharing weal and woe. Last September, President Julius Maada Bio paid a state visit to China and attended the Beijing Summit of the Forum on China-Africa Cooperation (FOCAC), drawing up a blueprint for the future development of bilateral relations with President Xi Jinping. Both sides should well implement the important consensus reached by the two heads of state, maintain high-level exchanges, enhance political mutual trust and continuously understand and support each other on issues concerning respective core interests and major concerns. Both sides should jointly push practical cooperation between the two countries in such areas as infrastructure, health care, agriculture, fishery and education for better implementation at an early date. The Chinese side is willing to combine the needs of the Sierra Leonean side with the Chinese side's strengths, make specific plans for implementing the results of the FOCAC Beijing Summit with the Sierra Leonean side, push the joint construction of the Belt and Road Initiative and turn the consensus of the two heads of state and the eight major initiatives into tangible results. Both sides should also strengthen strategic coordination in international affairs, safeguard the common interests of the two countries and developing countries and push international order to develop along a more just and reasonable direction. 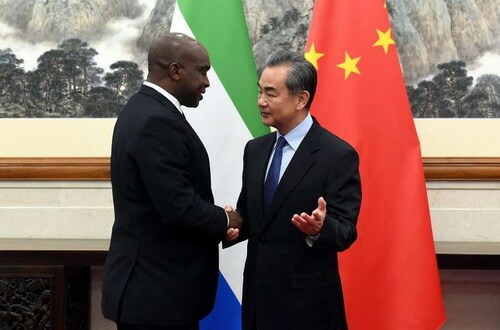 Alie Kabba said that the friendship between Sierra Leone and China has stood the test of time, wind and rain. The Chinese side always offers help and support to Sierra Leone whenever it is in difficulties. China is Sierra Leone's trustworthy and long-term cooperative partner. Sierra Leone adheres to the one-China principle and always takes developing relations with China as its diplomatic priority. Facing the international situation full of uncertainties, Sierra Leone and other African countries hope to strengthen coordination and cooperation with the Chinese side and stand together on the right side of history. The Sierra Leonean side thanks the Chinese side for providing long-term and strong assistance for the economic and social development of Sierra Leone, and is willing to learn from the Chinese side's experience in state governance and administration, work with the Chinese side to well implement the consensus between the two heads of state and the outcomes of the FOCAC Beijing Summit, deepen mutually beneficial cooperation in such areas as infrastructure, health care and fishery, and further strengthen coordination and cooperation in regional and international affairs. Both sides also jointly met the press after the talks.